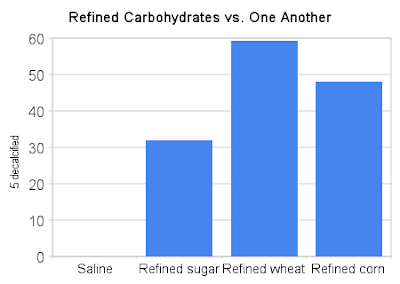 There's a definite association between the consumption of refined carbohydrates and dental cavities. Dr. Weston Price pointed this out in a number of transitioning societies in his epic work Nutrition and Physical Degeneration. Many other anthropologists and dentists have observed the same thing. I believe, based on a large body of anthropological and medical data, that it's not just an association-- sugar and flour cause cavities. But why? Is it that they lack micronutrients-- the explanation favored by Price-- or do they harm teeth by feeding the bacteria that participate in cavity formation? Or both? I recently found an interesting article when I was perusing an old copy of the Journal of Dental Research: "A Comparison of Crude and Refined Sugar and Cereals in Their Ability to Produce in vitro Decalcification of Teeth", published in 1937 by Dr. T. W. B. Osborn et al. (free full text). I love old papers. They're so free of preconceptions, and they ask big questions. The authors begin with the observation that the South African Bantu, similar to certain cultures Dr. Price visited, had a low prevalence of tooth decay when eating their native diet high in unrefined carbohydrate foods. However, their decay rate increased rapidly as modern foods such as white flour and refined sugar became available. After incubating teeth in the solutions for 2-8 weeks at 37 C (human body temperature), they had trained dentists evaluate them for signs of decalcification. Decalcification is a loss of minerals that is part of the process of tooth decay. Teeth, like bones, are mineralized primarily with calcium and phosphorus, and there is a dynamic equilibrium between minerals leaching out of the teeth and minerals entering them. 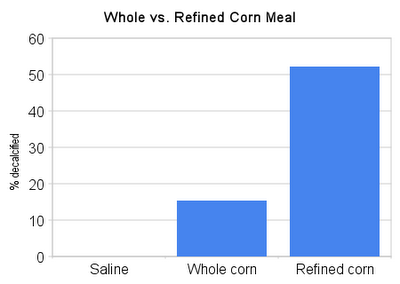 As one would predict from the graphs above, refined wheat is worse than refined corn, is worse than refined sugar. This is really at odds with conventional wisdom. It's important to keep in mind that these results are not necessarily directly applicable to a living human being, who wouldn't let a mouthful of wheat porridge sit in his mouth for five weeks. But it does show that refining carbohydrates may increase their ability to cause cavities due to a direct effect on the teeth (rather than by affecting whole-body nutritional status, which they do as well). The authors tested the acidity of the different solutions, and found no consistent differences between them (they were all at pH 4-5 within 24 hours), so acid production by bacteria didn't account for the results. They speculated that the mineral content of the unrefined carbohydrates may have prevented the bacterial acids from leaching minerals out of the teeth. Fortunately for us, they went on to test that speculation in a series of further investigations. In another paper, Dr. T. W. B. Osborn and his group showed that they could greatly curb the decalcification process by adding organic calcium and phosphorus salts to the solution. This again points to a dynamic equilibrium, where minerals are constantly leaving and entering the tooth structure. The amounts of calcium and phosphorus required to inhibit calcification were similar to the amounts found in unrefined cane sugar, wheat and corn. This suggests the straightforward explanation that refined sugar and grains cause decay at least in part because most of the minerals are removed during the refining process. However, we're still left with the puzzling fact that wheat and corn flour decalcify teeth in vitro more effectively than cane juice. I suspect that has to do with the phytic acid content of the grains, which binds the minerals and makes them partially unavailable to diffusion into the teeth. 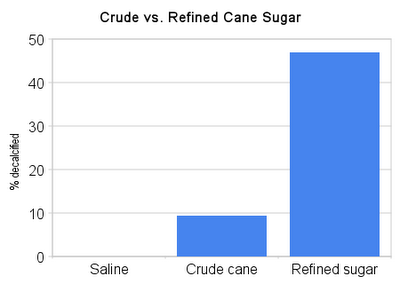 Cane juice contains minerals, but no phytic acid, so it may have a higher mineral availability. 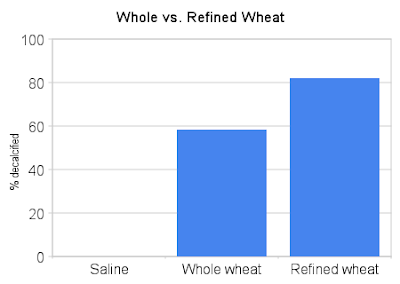 This explanation may not be able to account for the fact that refined sugar was also less effective at decalcifying teeth than refined wheat and corn flour. Perhaps the residual phytic acid in the refined grains actually drew minerals out of the teeth? No, I'm not saying you can eat sugar with impunity if it's unrefined. There isn't a lot of research on the effects of refined vs. unrefined sugar, but I suspect too much sugar in any form isn't good. But this does suggest that refined carbohydrates may be particularly effective at promoting cavities, due to a direct demineralizing effect on teeth subsequent to bacterial acid production. It also supports Dr. Price's contention that a food's micronutrient content is the primary determinant of its effect on dental health.